Meyer Family Vineyards exemplifies how the British Columbia wine industry has gone from insignificance to global respect in a very short time. Meyer began making only premium Chardonnay wines, coming to market in early 2008 with just 600 cases from a 1.6 hectare Naramata vineyard. It did not take owners JAK Meyer and Janice Stevens very long to realize the winery needed to be larger. By the end of 2008, they had purchased a larger second vineyard near Okanagan Falls. There was a block of Pinot Noir in that vineyard. By happy coincidence, Chris Carson, JAK’s Canadian-born but New Zealand-trained winemaker, has a passion for both Pinot Noir and for Chardonnay. Growth since then has been dramatic. “We are up to almost 8,000 cases this vintage,” JAK said in an interview in October, 2016. The winery has launched new products. Just released is Meyer’s first bottle-fermented sparking wine. The production, at 550 cases, is as large as Meyer’s entire first release in 2008. Meyer now makes enough wine that it has begun exporting to seven foreign markets including Britain, where Meyer Pinot Noir can be found in 169 Marks & Spencer stores. “I took it on myself to try to export,” JAK says. Marks & Spencer had been buying wine from an Ontario producer until several brutal winters savaged harvests from Niagara vineyards. Two years ago, the British retailer put out a call for wine through the British Columbia Wine Institute. Meyer was one of four Okanagan wineries willing to supply Marks & Spencer. The export sales appeal to JAK for two reasons. First, there is money to be made in overseas markets. Meyer is among a small number of Okanagan wineries that have chosen to specialize just in Pinot Noir and Chardonnay. There still is a small block of Gewürztraminer on the winery’s McLean Creek Vineyard near Okanagan Falls. The variety was there, along with Merlot, when JAK bought the property. Nearly all of the Merlot and most of the Gewürztraminer has been, or soon will be, replaced with either Pinot Noir or Chardonnay. JAK also is considering planting more Pinot Noir on a neighbouring parcel. In the meantime, he has been able to double the harvest at the Meyer vineyards with fences and cattle guards to keep deer away from the vines during 2016. Here are notes on wines currently released or due to be released before spring. Meyer Traditional Method Extra Brut NV ($40 for 550 cases). This is 70% Chardonnay, 30% Pinot Noir. The wine has had a total of four years aging in tank and bottle before its release. It has the slight bready note of classic Champagne. It also has brightly focussed fruit showing notes of lemon and granny smith apple. It is clean and fresh on the palate with crisp finish. The bubbles are fine and persistent. 92. Meyer Stevens Block Chardonnay 2015 ($28). This wine is from a small block of Chardonnay on the winery’s Old Main Road Vineyard near Naramata. The wine is unoaked and made in the style of Chablis. It has aromas and flavours of tropical fruits; peach mingles with lime on the palate. The wine is exquisitely fresh. 91. Meyer McLean Creek Vineyard Chardonnay 2015 ($33). This wine has aged in French oak barrels but, since only 18% were new, the oak influence shows just a slight hint of toast in the aroma, along with citrus. On the palate, buttery flavours mingle with hints of orange and apple. 92. Meyer Tribute Series Chardonnay 2015 ($33). 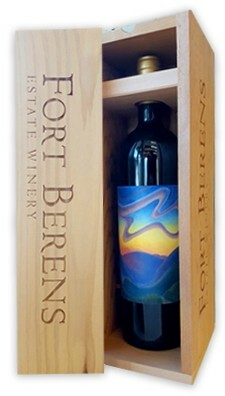 This wine, made with Naramata grapes, is the latest in the series of wines paying tribute to a worthy person or cause. The 2015 supports the Hawksworth Young Chefs Scholarship. The wine begins with a delicate gold hue and aromas of lemon. It is rich on the palate, with lemon and tropical fruits framed by well integrated oak. 92. Meyer Micro-Cuvée Chardonnay 2015 ($65). This powerful wine is due for release next March. It was aged 11 months in French oak barrels (50% new). Brioche in the aroma and flavour mingles with lively citrus flavours. This elegant wine will age superbly. 95. Meyer Okanagan Valley Pinot Noir 2015 ($25). This wine was aged in older oak barrels which softened the wine without adding much oak flavour. It has aromas and flavours of cherry and strawberry. The juicy texture adds to the wine’s immediate appeal. 90. Meyer Old Block Pinot Noir 2014 ($50). This wine is made from a small Pinot Noir block in the McLean Creek vineyard that was planted in 1994. The clone is unknown but the wine is exceptional. It begins with aromas of black cherry and plum with hints of forest floor. This is echoed on the palate, where the finish is spicy and savoury. Only 205 cases were made. 93. Meyer Micro-Cuvée Pinot Noir 2014 ($65). This wine is made by choosing the best block and best clones from the McLean Creek Vineyard and then selecting the best barrels to produce 110 cases. It will be released next March. This aged 11 months in French oak (50% new). The wine has aromas of cherry and vanilla. On the palate, the flavours of plum and cherry are subtly integrated with toasty oak. The finish has savoury notes of forest floor. 95. The many fans of Orofino Vineyards will be delighted to learn that this Similkameen winery plans to release a bottle-fermented sparkling wine. The release date has yet to be determined. I heard about it in October during a winery tasting with the owners, John and Virginia Weber. The wine, based on Riesling, was made in the 2013 vintage and was still resting on the lees this fall. It is likely there will be a release during 2017. I also learned that John has increased his commitment to concrete tanks and to fermenting with wild yeast. These techniques help showcase the terroir of the Similkameen vineyards behind Orofino’s wines. The tanks are used for aging the wines. John still ferments his reds in open-top fermenters. He believes that “there is something to it. We are doing Syrah in concrete. I have a tank of Riesling this year. We have done Pinot Gris in concrete. And there is a vein throughout. It is a textural thing.” The 2015 Syrah, already sold out, is notable for its juicy texture after aging just five months in concrete. John now ferments most of his wine with wild yeast – or indigenous yeast, a term preferred by some of his peers who have also stopped using cultured yeast. In previous vintages, many Okanagan and Similkameen winemakers thought that wild yeast was risky. Most have gained confidence that the yeasts on the grapes or floating around the winery will do the job just fine. Wild yeast ferments may proceed more slowly and occasionally stop before all of the sugar is consumed. Both issues can be managed. The reason for this, he speculates, is that reds are fermented on skins with a resident yeast population. Whites are pressed off the skins before fermentation, separating them from some of the natural yeast on the skins. The Orofino wines, almost without exception, now carry the designation of the vineyard that produced the grapes. This adds an element of interest to collectors. If, for example, you buy all the Rieslings released from a vintage, you have a vertical. The wines can be compared and appreciated for what each vineyard delivers. Or you can buy the same single vineyard each vintage and develop a vertical that way. I might suggest buying and cellaring the winery’s Passion Pit Cabernet Sauvignon, for several reasons. The grapes are from a two-and-a-half-acre rocky vineyard wedged against a mountain where the vines get a lot of sun. John thinks it may be the best Cabernet Sauvignon site in Canada. The rest of the site is still planted to apple trees. Last year, the orchard and the vineyard were both sold to an orchardist. He plans to refresh the apple varieties and, to John’s surprise, suggested the Cabernet vines might also be replaced with fruit trees. The Webers quickly concluded an arrangement to farm the vineyard at least for the next two vineyards, and hopefully beyond that. So, jump on the Passion Pit Cabernet Sauvignon as long as it is available. Orofino Hendsbee Vineyard Riesling 2015 ($22). This dry wine has aromas and flavours of lemon and lime with a backbone of minerals. The racy acidity gives the wine a bright and refreshing finish. Notes of petrol have begun to develop, telegraphing the complexity that will emerge with moderate aging. Here is a hint: the Webers are now drinking the 2006 vintage! 91. Orofino Scout Vineyard Riesling 2015 ($22). Fermented in stainless steel, this wine has aromas and flavours of green apples and stone fruit with notes of lime. An imperceptible amount of residual sugar balances the acidity. The wine has a lingering dry finish. 91. Orofino Old Vines Wild Ferment Riesling 2015 ($29). The fruit for this wine is from vine planted in 1989. The wine was fermented and aged in barrels – presumably neutral barrels which left little oak influence in the wine other than its texture. Again, there is some residual sugar that balances the racy acidity. There are flavours of lemon, peach and ripe apple. 90. Orofino Wild Ferment Syrah 2015 ($29). This wine was aged in concrete, giving it a rich and juicy texture. It begins with aromas of black cherry and spiced fruit cake which are echoed on the palate. There is a touch of white pepper on the finish. The wine is sold out. 91. Orofino Scout Vineyard Syrah 2014 ($29). Aged 20 months in oak, this wine has just been released. It begins with aromas of black cherry and vanilla leading to flavours of plum, fig and black olives. A pinch of pepper punctuates the finish. 92. Orofino Passion Pit Vineyard Cabernet Sauvignon 2013 ($29). This is reminiscent of a Margaret River Cabernet Sauvignon with the hint of mint on the nose, along with cassis and vanilla. On the concentrated palate, there are flavours of black currant, dark chocolate and black coffee. Twenty months aging in oak barrels contributed to the elegance of the texture. 93. Orofino Beleza 2013 ($34 for 600 cases). This blend is Cabernet Sauvignon 35%, Merlot 35%, Petit Verdot 20% and Cabernet Franc 10%. Each varietal was aged separately in oak for 20 months before the finished wine was blended. This is Orofino’s flagship red. The aromas of black currant jam, blueberries, spice and vanilla explode from the glass. That dramatic introduction leads to flavours of black currants, blackberry and blueberry. The long ripe tannins still have a little grip, suggesting that the wine will age well. 94. In another sad week in British Columbia’s wine country, Wild Goose Vineyards and Winery announced the death on November 20, 2016, of its founder, Adolf Kruger. He was one of the most influential pioneers of the British Columbia wine industry, which now has more than 300 wineries. Wild Goose was just the 18th winery when it was licensed in 1990. A government official said he would be lucky to sell 2,000 bottles a year. Wild Goose now makes and sells about 11,000 cases a year. The winery has won more Lieutenant Governor’s Awards for Excellence in Wine than any other Okanagan winery. Adolf has been honoured by the industry with, among other accolades, the Founder’s Award in 2006. A modest man (with no reason to be modest), Adolf was literally speechless when the award was presented. I got to know him during numerous interviews and tastings at the winery. In latter years, that always involved a lunch with Adolf and his two sons in the kitchen of the family home. As his wife, Susanna, laid out cold cuts and freshly-baked buns, the Kruger men matched each other with highly entertaining wine industry commentary. The lunches ended after Susanna, who had as sharp a wit as her men, died in 2014. Those who came to know Susanna and Adolf experienced a very special couple. I expect the winery will be jammed on the afternoon of December 3 for an open house to remember Adolf. Here is a long except from my 1994 book, The Wineries of British Columbia. The profile includes much detail on Adolf and his family. Hagen Kruger is now the winemaker, as is son, Nik. Roland handles wine sales. Adolf Kruger was born in 1931 in Kehrberg, a German village southwest of Berlin; his wife, Susanna, is from a German-speaking enclave in Rumania. A compact but muscular man, Adolf was raised on a farm far distant from wine country. "It was strictly potatoes, asparagus and rye," he says. In 1949 the entire Kruger family fled the communist regime of East Germany and spent a year as refugees in West Germany. Adolf and a brother came to Canada to work on a wheat farm near Winnipeg for the 1951 harvest. Once the harvest was completed, they headed for the city. It was here that Adolf completed the high school he had missed in Germany and, after spending two years in university, became an electrical designer. Susanna had emigrated to Winnipeg independently in 1951, where she worked as a seamstress and met Adolf. In his spare time, Adolf began designing yachts, a passion that led the Krugers to move to Vancouver in 1964. He designed boats for others and eventually built his own twenty-four-foot sailboat, later sold because Susanna proved to be, in Adolf's phrase, "a whiteknuckle sailor." In Vancouver Adolf worked for Wright Engineers Ltd. an engineering consulting firm, in a drafting design job that involved several exotic overseas assignments, including more than a year in Syria and Iran on a pipeline construction project. When the engineering firm reduced staff during the 1982 business recession, Kruger was loaned to another consulting firm. Apprehensive about this temporary arrangement, he began looking for a career change. Wild Goose has been a family business from the start because Adolf invited his sons, Hagen and Roland, to join him as partners. Hagen, born in 1960, had become a draughtsman (and still works in that trade), while Roland, born in 1964, worked as an electronics technician until he joined his father full-time at the winery. One result of the partnership is that the Wild Goose wine shop is always manned by some member of the family, usually either Susanna or Hagen's wife, Kerry. "People really enjoy going into farm wineries and being able to talk to the owners," Roland believes. One day after closing the purchase, Adolf Kruger went to take a closer look at the barren tract on which he was hanging his future. Noticing a path, he followed it to a small clearing, completely surprising a large flock of geese feeding there. "They literally exploded, frantically trying to get out of this clearing," Kruger recalls. He ducked and shielded his head against panicking, low-flying geese. "It struck me as an omen," says Kruger, an avid and experienced fowl hunter. He decided: "If I ever get a vineyard here, I'll call it Wild Goose." He thinks that the name gets across the message that he makes Canadian wines. Adolf Kruger is a patient and pleasant man, but he bristles when someone suggests he is making wines on a German model. When the Krugers canvassed the wineries on what to plant, they were routinely told to plant hybrids. "A lot of people were mentioning Foch and Chelois," Roland recalls. "But being originally from Europe, he had ideas of putting in European varieties." Adolf knew which grapes make the best wines, for he had been a keen amateur vintner in Vancouver, one of the most serious of the winemakers in his hobby circle. They were all using vinifera grapes from California Kruger's favourite reds were made by blending equal quantities of Zinfandel and Alicante — and he decided his ten-acre vineyard would be planted entirely to vinifera. With white wines then in vogue, he planted only white varieties, Gewürztraminer and Johannisberg Riesling, and, not then planning his own winery, contracted the grapes to Mission Hill winery. The Krugers believed that their soil, with its rocks, clay and sand on a southern exposure, was particularly good for Riesling. The natural progression from grape growing is to winemaking, Roland observes. The idea had been planted during a family vacation to Washington's Yakima Valley, which is dotted with small family-owned wineries. Something else also nudged the Krugers: the rising concern among the growers that the coming free trade era would cripple commercial wineries in British Columbia, who would then try to survive by offering low prices for grapes. "The last thing we wanted," Roland says, "was to be stuck with ten acres of grapes and to be offered $200 to $500 a ton. So we independently began lobbying the government, writing letters, talking to individuals, and this went on for two or three years." Eventually, they learned that two other small growers were doing the same thing. It was not until a 1988 meeting in Penticton with government bureaucrats that the Krugers actually met Günther Lang and Vera Klokocka, who had also been pestering the politicians for licences. One of the government officials, fed up with being pressured, asked the three growers just what they wanted. Backed by his colleagues, Adolf Kruger spent half an hour sketching out what became the parameters for farmgate wineries. Shortly thereafter, Premier Bill Vander Zalm took a personal interest and, as Roland says, "it wasn't too long after that that we had the guidelines for small wineries." Adolf Kruger prefers to give the credit to a presentation made to Vander Zalm by two other growers, Terry Wells and Alan Brock. He is convinced that if Vander Zalm had not gone to bat personally for the farmgate winery concept, it might never have emerged from the bureaucracy. With his memory for anecdotes, Roland recalls vividly the date when the Krugers received the coveted licence: June 11, 1990. It was a nasty, cold day, pelting with rain — and a customer showed up at the door to buy wine. "He came in and loved the wines," Roland recalls. So did subsequent customers. "We are a bit stunned by our success — it exceeded our expectations," Adolf says. However, that understates how tough it was at first. There was a concern among consumers and restaurateurs that the quality of farmgate wines would seldom be better than that of homemade wines, especially since several estate wineries earlier had come to market initially with disappointing products. The Krugers, like the other farm wineries, had to hand-sell wines, persuading buyers one at a time. With no wines listed in the liquor stores, the personable and easy-going Roland Kruger took to the road, selling restaurants and convincing private stores to carry Wild Goose wines. "In the Vancouver area, I set up a network of beer and wine stores to handle our products," he says. "It was a selling job . . . but now they help us push our products." The various impractical regulations imposed on farmgate wineries have not made his job any easier. For example, farmgate wineries are not supposed to warehouse their wines off the winery premise itself and they must be paid immediately for the wines they deliver. The Krugers have invested carefully and modestly in equipment, buying it — Roland calls it scrounging — around British Columbia, from the Pacific Northwest and from Germany. The winery's horizontal basket press was designed and built by Adolf. Recently, the Krugers have begun to invest in American and French oak barrels for aging their reds, Adolf being a particular fan of big reds. "I don't care for oaked whites," he says. "I like a rather fresh or fruity white wine. But I do prefer to age reds in oak." In 1994, when the winery was enlarged and a spacious tasting room added, Wild Goose released its first Pinot noir and made its first Merlot. "Our goal in the first couple of years was to produce clean wines, wines with no faults," Roland says modestly. The recent election in the United States may have put the Paris Accord on climate change into some trouble. However, foot dragging by a state is no excuse for the rest of us to drag our feet as well. 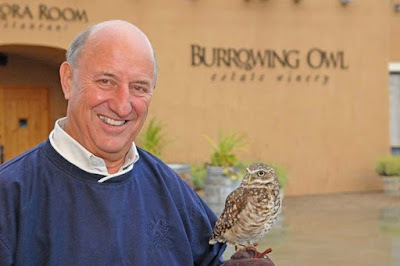 On that score, I must pay tribute to the way that the Jim Wyse and his family at Burrowing Owl Estate Winery continue to lighten the winery’s environmental footprint while making excellent wines. There are notes below on six of the winery’s most recent releases. I have also gone to the winery’s website and I am reproducing Burrowing Owl’s commendable work with solar energy over the last 10 years. The south Okanagan valley is one of Canada’s best locations for capturing perpetual, green energy from the sun and converting into either heat or electricity. In 2016 Burrowing Owl is moving forward with a major commitment to photovoltaic (PV or electrical) solar panels, that will produce clean/green electricity efficiently for the next 25 years. Ten years ago, Burrowing Owl winery made its first foray into renewable solar energy panels to produce hot water, a commodity that wineries use in large quantities for barrel washing and other cellar-related cleansing functions. During the hottest summer months, our hot-water solar panels actually produce more hot water than we can use or store, so any excess heat is “dumped” into our swimming pool to the delight of our Guest House patrons. The existing solar panels currently produce the equivalent of 48,000 kWh (kilowatt-hours) annually, and offset CO2 emissions of approximately 12,300 Kg (13.6 tons) annually. During the last couple of years, like flat-screen TVs, the price of solar panels has plummeted as world-wide acceptance of the technology takes hold. Perhaps because of the abundance of hydro-electricity in this province, and the low cost of electricity here, the incentive to move to solar electric alternatives lags far behind the rest of the world, despite the significantly reduced up-front installation cost of recent years. In 2016 Burrowing Owl will be installing three sizable solar electric systems in conjunction with the new construction that is currently underway at the winery (July 2016) which will ultimately increase the size of our cellar by 7,500 sq ft. This expansion at the northern end of the winery has 3,350 sq. ft. of open roof-top space. This area will be blanketed by 70 solar panels, each producing 310-volts of electricity. In total these 70 panels are expected to produce 25,770 kWh/year, while offsetting approximately 13,825 Kg (15.2 tons) of CO2 emissions annually. In the centre of our parking area is a landscaped “island” where 12 cars would normally park. By the late fall of 2016, we hope to have designed and installed a protective cover over these 12 parking spaces that will consist of a roof that provides shade and protection from rain, and will support 220 solar panels. These panels will generate 80,500 kWh/year and will offset CO2 emissions of 43,175 Kg (47.6 tons). The winery’s main warehouse is located in Oliver, and currently is also undergoing expansion so that in the end it will contain 45,000 sf of heated/air-conditioned and secure space. In spite of rigorous wall and ceiling insulation, the average electrical power usage is approximately 65,000 kWh/annually. As part of the new construction work, 161 solar panels will be installed on the south-facing portion of the roof that will generate almost exactly our annual usage (65,000 kWh/year) and reduce carbon emissions by 34,900 Kg (38.4 tons). Since the energy produced will match the energy used, this facility will have a “zero carbon footprint”, probably the first such claim to be made in our region by anybody. As a demonstration of our support for electrically powered automobiles, in 2016, Burrowing Owl will be installing four charging stations in the parking area for the use of our visitors and staff. In 2006, Burrowing Owl took its first step into renewable energy with an investment into solar hot water panels. Our second step in 2016 will be to install three separate clusters of solar electric panels totalling 451 panels that will produce a total of 171,200 kWh/year off the grid, forever. By the end of 2016, the total contribution of solar energy at Burrowing Owl from all sources, will be the equivalent of 220,000 kWh/year, which will offset carbon emissions by 115 tons/year. These are large numbers, and both of which we are very proud. Burrowing Owl Chardonnay 2014 ($25). This restrained and elegant wine begins with buttery, citrus aromas leading to flavours of citrus and stone fruit, with subtle notes of oak. Sixty percent of the wine was fermented in oak, mostly French, of which 30% was new. 91. Burrowing Owl Pinot Noir 2014 ($30). The wine begins with aromas of cherry and strawberry. On the palate, the fruit flavours unfold layer after layer, with notes of cherry, blackberry and spice. The velvet texture completes the personality of a very pretty wine. 91. Burrowing Owl Syrah 2014 ($40). The wine begins with aromas of ripe, dark fruit – plum and black cherry – with floral notes, perhaps reflecting the four percent co-fermented Viognier in the blend. It is rich and juicy on the palate, with a smoky hint on the finish. 92. Burrowing Owl Merlot 2013 ($30). Dark in colour, the wine begins with ar0mas of black currant and blueberry. On the palate, the fruit is ripe and intense – black cherry, black currant, mulberry – but also vibrant, with spicy notes on the finish. The texture is firm. 92. Burrowing Owl Cabernet Sauvignon 2013 ($35). This wine begins with aromas of black cherry and vanilla. On the palate, there is a core of sweet fruit (cherry, black currant) with a hint of eucalyptus. There is savoury fruit on the finish. The long ripe tannins give the wine a polished texture. It is drinking well now but also will age well for 10 years. 92. Burrowing Owl Athene 2013 ($38). This is 52% Syrah and 48% Cabernet Sauvignon, fermented together. It is generous on the palate, with layers of fruit – plum, blueberry and black cherry – with chocolate, coffee and tobacco on the finish. The fullness comes from the Syrah and the backbone from the Cabernet. A delicious wine. 93. The recent obituary of Daniel (Den) Dulik, a legendary Kelowna grow grower, was surprisingly understated. He always struck me as a strong and genuine personality. His life needs to be fleshed out and I will try to do that by reproducing what I wrote about Den in my 1996 book, The British Columbia Wine Companion. For greater perspective on that life, I include the entries on his father, Martin, and on his daughter, Susan. Den or Denny, as he was known to friends and family, will be dearly remembered for his incredible sense of humour, warm heart and unbelievable work ethic. Den was an absolute pioneer for the BC wine industry - having owned and operated Pioneer Vineyards in South East Kelowna for several decades. He established some of the earliest vinifera in Canada on our site, planting Riesling sourced from the Weis family of Mosel's St. Urbans-Hof winery back in 1978. We at Tantalus credit Den, his wife Pat and daughter Sue with much of our success. From tying vines in the spring, to tasting ferments with our winemaking team, to spending hours on the tractor mowing rows - Den was integral to our operations and his wealth of farming knowledge has enriched our practices. Although Den didn't feel up to harvesting grapes with us this year, he still popped by daily on his John Deere, cracking jokes and keeping our picking team's morale up. Anyone who crossed paths with him was touched by his sharp wit, infectious smile and caring heart. 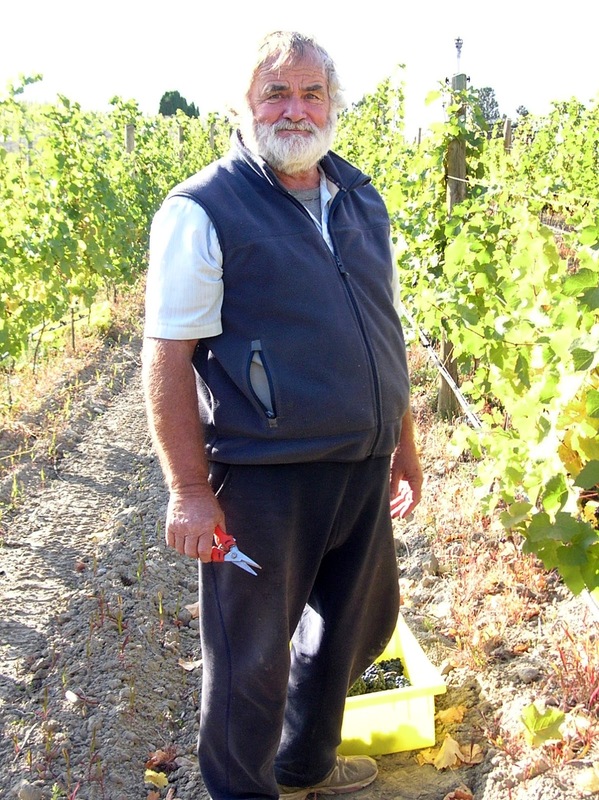 Dulik, Daniel (Den) (1939-): Born in Kelowna, Dulik learned the art of grape growing from his father, Martin, gradually taking over the operation of the Pioneer Vineyard at the very end of Hughes Road, east of Kelowna. The amiable, barrel-shaped Dulik is one of the few growers who made the jump from labrusca grapes to vinifera without a significant stop with the hybrids. The first of the vineyards planted by J.W. Hughes, Pioneer was given over entirely to labrusca table grapes, many of which were sold to wineries for the fortified pop wines popular in the 1960s. With the exception of a small planting of maréchal foch, Den Dulik declined to plant hybrids because he did not think those varieties were sufficiently better than his labrusca. (After all, his vivacious wife Patricia, an accomplished home food processor, was able to win awards with her home-made white wines made from diamond grapes.) However, in 1978 Dulik -- and his even more skeptical father -- were persuaded by Jordan & Ste-Michelle winemaker Josef Zimmerman to plant white riesling. Zimmerman argued that, if the variety was hardy enough for German vineyards, it would also thrive in Kelowna. The clay-loam vineyard, because of its southwesterly slope, is one of the warmer sites among the vineyards east of Kelowna. The Duliks planted five acres and, over the next decades, learned that Zimmerman was right. At the first industry-wide competition in 1982 (at Septober), the winery won a gold medal for a 1981 riesling special reserve made from Dulik grapes. Pioneer Vineyard, now with twenty-nine acres under vine, also includes bacchus and optima (also Zimmerman recommendations), pinot noir, pinot blanc, chardonnay and pinot meunier. "I'm happy with them all," Dulik says. Dulik, Martin (1907-1987): Born in Czechoslovakia, Dulik came to Canada when he was fifteen and, after a decade in Saskatchewan, he and his new bride came to the Okanagan, looking for work. In 1934 Dulik was hired by J.W. Hughes to work on the Pioneer Vineyard just southeast of Kelowna and ultimately became a foreman. In 1944, when Hughes began selling the vineyards to his foreman, Dulik agreed to buy the Pioneer Vineyard. The terms (which were extended to other foremen as well) were unusual but then neither Dulik nor the others had ready cash. Dulik acquired the vineyard over seven years by paying the income tax on the crop and giving Hughes the proceeds from half the crop. Grapes were sold both to the fresh market and to Growers' Wines in Victoria, with the wine grape market becoming the major market with the expansion of wineries in the 1960s. Dulik also was one of the leaders in the 1961 formation of the Grape Growers' Association. Sulik, Susan (1962-): Born in Kelowna into one of the pioneer grape-growing families, Susan Dulik was drawn irresistibly to the wine industry by the infectious enthusiasm of the winemakers who continually visited the family's Pioneer Vineyard. When she asked for work at Jordan & Ste-Michelle, the winery to which her family then sold grapes, she was offered a tour guide's post in 1980 at the Ste-Michelle winery in Surrey. "I just had a ball," she recalls. After three years, she was promoted to sales and administration work and stayed with the winery until it closed in 1990, took a year's sabbatical and then came back to the industry, first working with CedarCreek and then with Summerhill. "I decided I wanted to open my own winery," she said. Winemaker Eric von Krosigk, her mentor at Summerhill, instilled the belief that good wine begins with good grapes. Susan Dulik had not been a great student of viticulture before but she joined her family at Pioneer Vineyards in 1992 and was surprised that she enjoyed vineyard work. She soon began making trial batches of wine in preparation for the farmgate winery planned to open in 1997 under the name, Pinot Reach Cellars. Susan Dulik's wines are clean and fresh, the result of a minimalist style of winemaking that dictates interfering with the wines as little as possible. "I just leave them alone -- keeping them incredibly clean but letting the wines be," she says. When I interviewed Susan and her parents just before Pinot Reach opened, she explained the rationale for the name: the winery would focus on Pinot varieties and it would reach for quality. Ironically, the first Pinot Reach wine to attract international praise (from Jancis Robinson, no less) was the Old Vines Riesling from that her father’s 1978 planting. The winery was renamed Tantalus after Vancouver investment dealer Eric Savics bought the Pioneer Vineyard. It continues to make Old Vines Riesling, and the wine still gets plaudits from Robinson and other wine writers. It is arguably the best Riesling in the Okanagan. When those vines were originally planted, Den is said to have christened a few with wine from a bottle of St. Urbans-Hof Riesling. Now, someone should pour a bottle of Old Vines Riesling on Den’s grave. Ruth Saari: Forty-One Years on the Pioneer Vineyard: Forty-fifth Report of the Okanagan Historical Society, pp. 112-116. Photo: John Levine's portrait and hat crown the wines in the 2016 competition. When the SIP Wines VQA store in Richmond closed early this year, there was concern that it also meant an end to the annual BC Iconic Reds tasting after eight years. Fortunately, Sutton Place Wine Merchants stepped up as the wine store sponsor. The ninth annual tasting has just concluded. The tasting, which the sponsors now bill as “British Columbia’s Premier Wine Tasting Competition,” emerged from brainstorming between the late John Levine and the owners of SIP Wines, Simon and Sandy Wosk. The idea was a competition among the best of British Columbia’s Bordeaux style reds. This year, about 100 wine lovers gathered in a ballroom at the Sutton Place Hotel to taste and judge 20 leading Okanagan red wines. The wines, which had been decanted in the afternoon, were served one at a time in a random order. Of course, the wines were not identified until the two-hour tasting was over. At the end, the tasters voted on their top five picks, an arbitrary but sensible number to prevent overwhelming the computer tabulation. Rating all 20 wines would have meant an evening as long as the recent American election. I have listed the five winners, followed by the others in alphabetical order. The tasting notes are from the wineries where such notes were available. Otherwise, I have inserted my tasting notes. These are 20 of the best reds from three excellent recent vintages. Some of these wines are hard to find but Sutton Place Wine Merchants has allocations of all. The limited volumes mean buyers will need to move quickly to get these. 3. Clos Du Soleil Signature Red 2013 ($45) Merlot 51%, Cabernet Sauvignon 34%, Cabernet Franc 11%, Petit Verdot 2%, Malbec 2%. Aged 17 months in French oak barrels. 5. Hester Creek The Judge 2012 ($45). Merlot, Cabernet Sauvignon, Cabernet Franc. Alcohol 14.3%. Aged 26 months in oak barrels. Production 900 cases. Black Hills Nota Bene 2014 ($52.09). Cabernet Sauvignon 52%, Merlot 33%, Cabernet Franc 15%. Alcohol 14.9%. Aged 16 months in barrels. Production 3,300 cases. Lariana Thirteen 2013 ($45). Cabernet Sauvignon 68%, Syrah 20%, Carmenère 12%. Alcohol 14.5%. Production 555 cases. Fermented and aged separately until blending at 8 months. Total aging 20 months, predominantly in French oak. Production 555 cases. Poplar Grove Legacy 2012 ($45). Merlot 45%, Cabernet Sauvignon 25%, Cabernet Franc 22%, Malbec 7%, Petit Verdot 1%. Alcohol 14.7%. Production 2,087 cases.